For this study, we analyzed 5,704,281 results from 3,828 marathon races. All the races taken into account had a minimum of 2,000 participants. We recently published our mega-study on Americans getting slower and were curious to see how the individual states are performing. Do all states conform to the overall trend? Feel free to use any material from this page, as long as you refer to this original source. We've also created a tool that can help you compare your race results to your fellow Americans. The fastest state in the US for 2016 is Massachusetts. D.C. is second and Vermont is third. The three slowest states, in that order, are - Louisiana, Hawaii, and Mississippi. Changes in finish times for the period 2000-2016. We will now consider all of them in detail. Washington D.C. - better than Maryland and Virginia. First, let's take a look at the average finish time gender-wise. For women, the Top 3 states again are Massachusetts, Vermont, and D.C. Vermont. 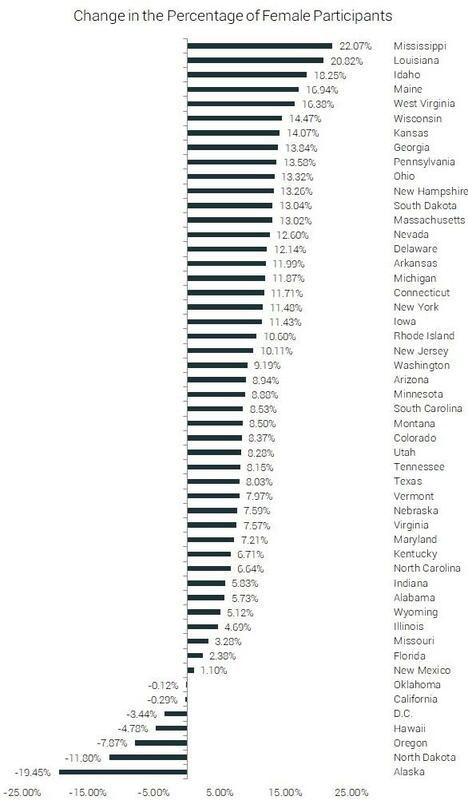 women are 1.1% slower than the ones from Massachusetts. The women from D.C. are 1.4% behind. The slowest women are from Mississippi, Arkansas, and Hawaii. 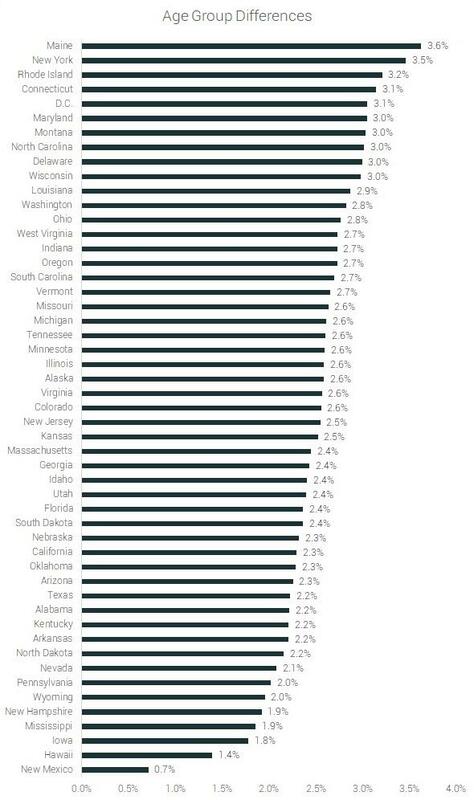 The differences between these states and the fastest one (Massachusetts) are Mississippi - 17.5% slower, Arkansas - 17.6% slower and Hawaii - 19% slower. For the men, the ranking is a bit different. 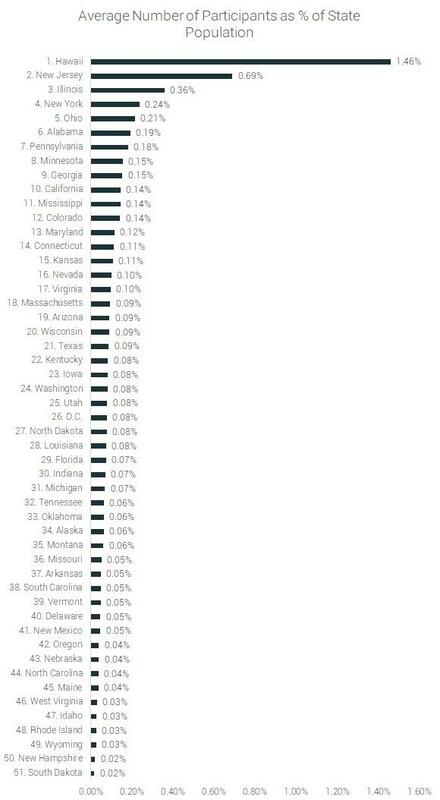 Here Vermont is number one and Massachusetts and D.C. follow. 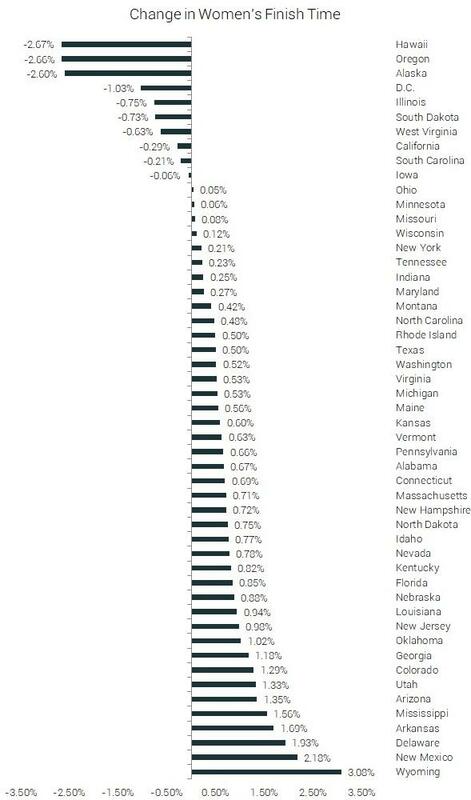 Massachusetts men are just 0.1% slower than the ones from Vermont. And the ones from D.C. are 1.4% slower. The slowest men are from Louisiana, Hawaii, and Mississippi. 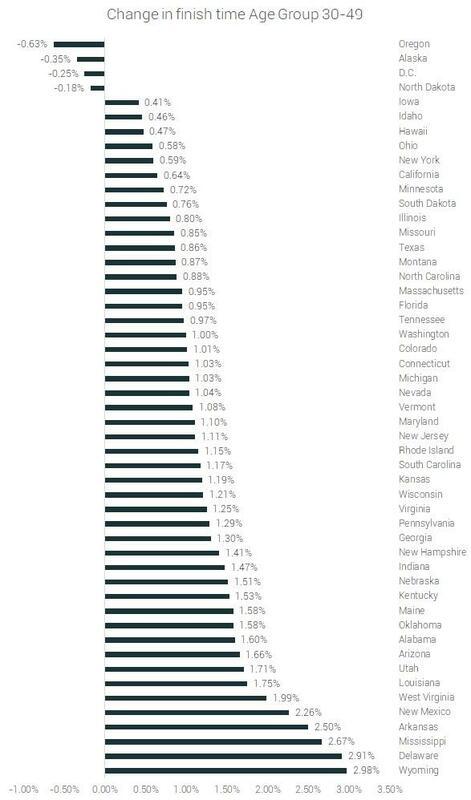 Compared to Vermont they are 13.8% (Louisiana), 18.6% (Hawaii) and 19.4% (Mississippi) slower. 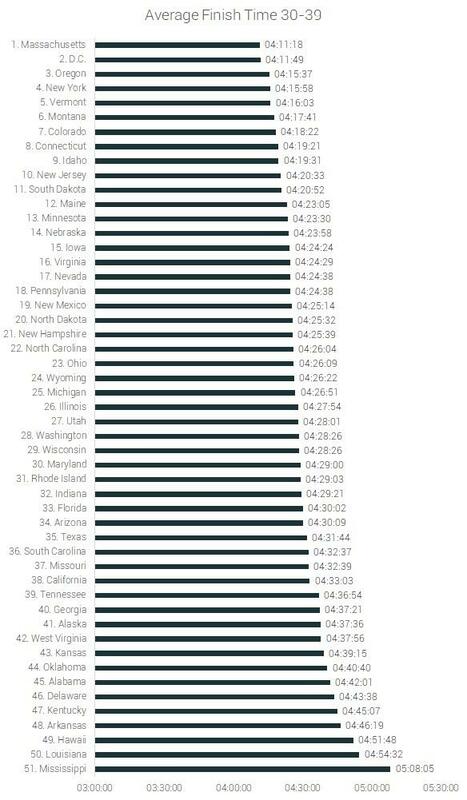 When we compare the male and female finish times we see that on average men from some states are slower than women from other states. The following table makes it easier to compare. 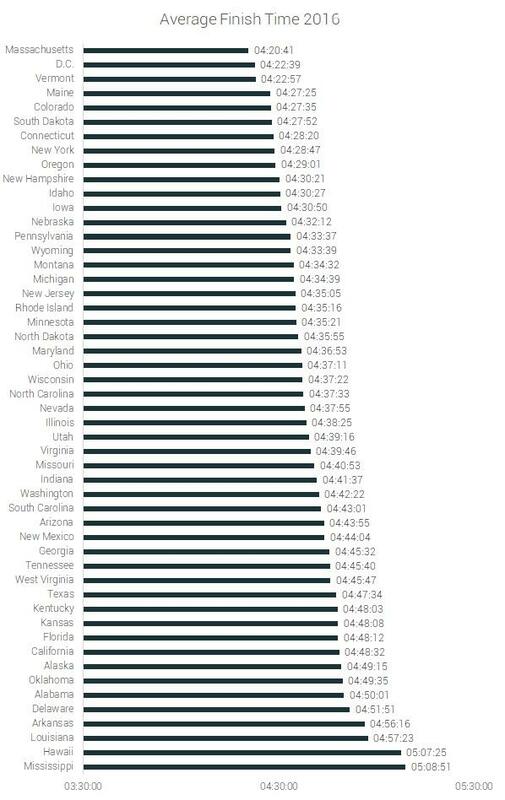 For example, we can see that the average time of Kansas men is 4:33:52 and the average time of Massachusetts women 4:33:45. 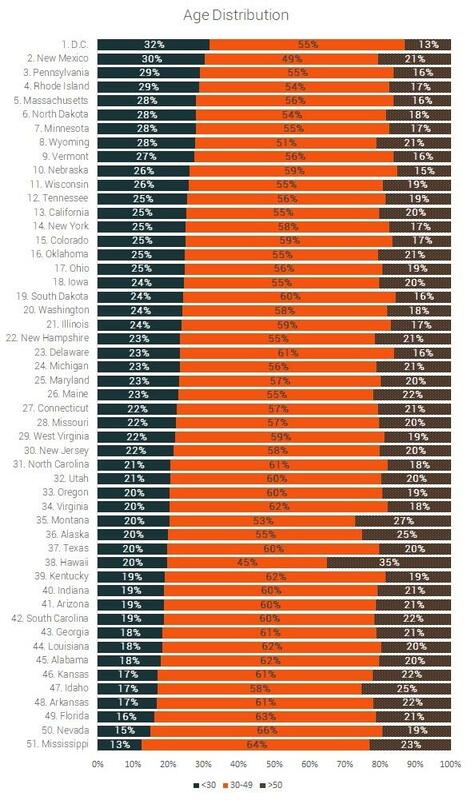 This makes Kansas men slower than Massachusetts women, which is less than flattering to them. The women from Massachusetts are faster than the men from 12 other states - Kansas, Florida, Delaware, Oklahoma, California, Kentucky, Arkansas, Texas, Alabama, Hawai, and Mississipi. 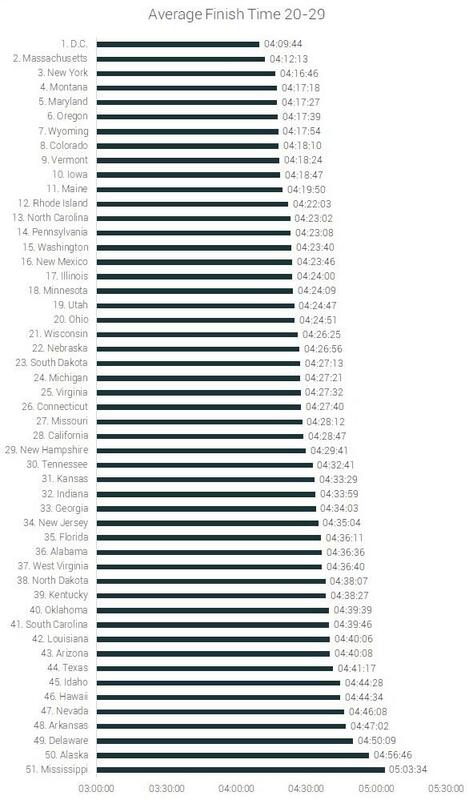 And the men from Mississippi are slower than the women from 32 states. 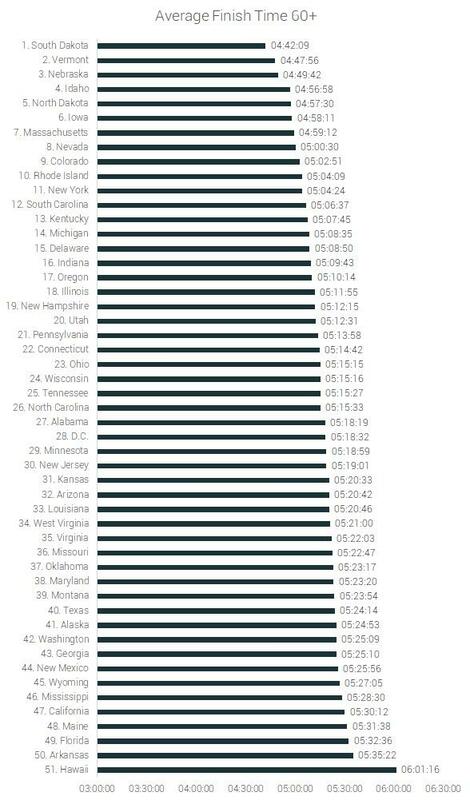 Here we compare the average finish times of men and women from the same state. The purpose is to see how much the women are slower than the men in the state. On average this difference is 10.1%, but the individual states vary from this number quite a bit. 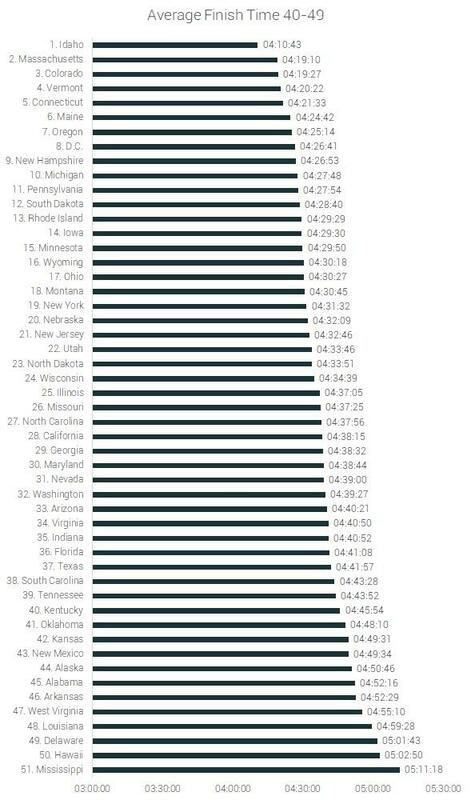 The state with most homogenous finish times is Alabama, where men are just under 5.5 % faster than women. This small difference puts Alabama women at 33rd place and Alabama men at 48th in the rankings by gender. 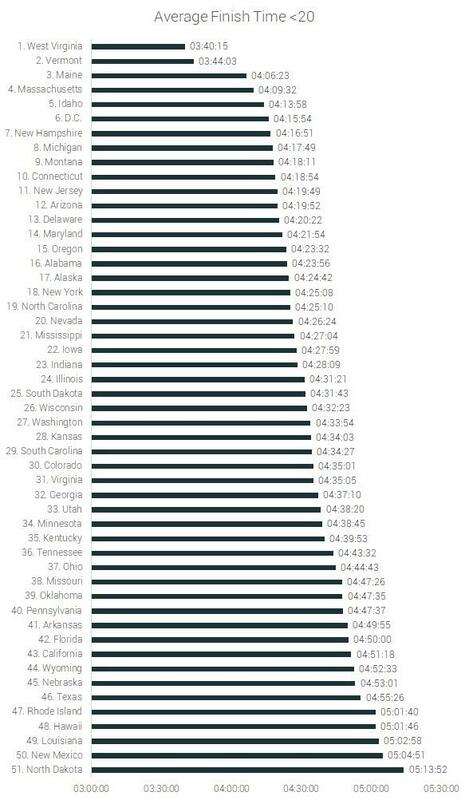 So, it turns out that the men and women from Alabama are not consistently fast, but consistently slow. 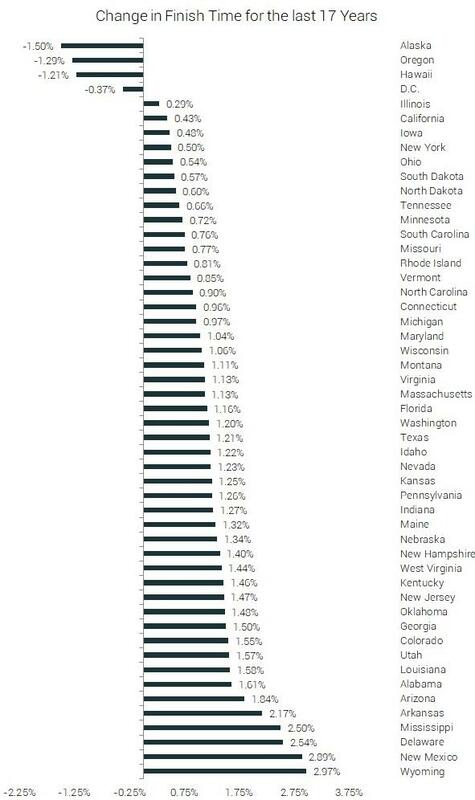 This is not true only for Alabama - most of the states with smaller than the average difference between male and female performance are from the less fast states. This means that in those states not women are closer to male speed, but the opposite. The Top 3 states - Massachusetts, D.C., and Vermont have close to the average difference in male and female finish times. Just Vermont has a slightly above average split of the speeds and this might be the reason for it being number 3 in the overall ranking, despite its fast men. Another factor to consider, regarding gender, is the male/female proportions of the participants. In 2016 there were 5 states with predominantly female participants - Hawaii, Kentucky, Missouri, Iowa, and South Carolina. In the last 17 years, the proportion of female participants has been on the rise. The following graph shows how much the proportion of female participants has changed between the year 2000 and 2016. It is interesting to note that the states with the biggest proportion of female participants in 2016 could be found on the bottom of the following graph. With Hawaii actually having a decline (-4.8%) in the percentage of women participating. So, the states with the smallest changes in male to female ratios are the ones with a traditionally large proportion of women. Iowa and South Carolina are different as they have shown an increase in female participation. Iowa with 11.4% and South Carolina with 8.5%. The first factor regarding age we consider is the average age of the participants. Though D.C. has the youngest participants it still ranks number 2 by finish time. And the other two from the top 3 fastest states are in positions 5 and 9. The three slowest states are respectively - Louisiana in 18th place, Hawaii in 48th place and Mississippi in 42nd place. It is easy to see that the correlation between the finish time rankings and the average age ranking is not good. We have calculated the average finish time for the following six age groups. In the different age groups, we see a lot of deviation from the overall ranking. In the Under 20 category, West Virginia is number 1 (37th in the overall ranking). 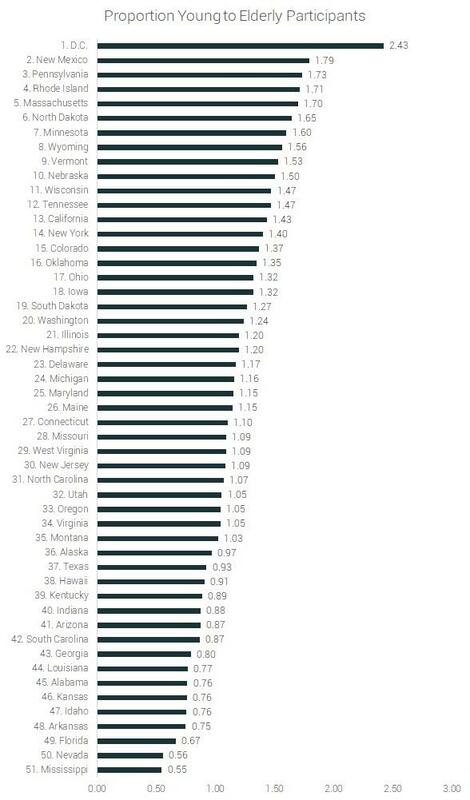 It is also surprising that Mississipi ranks 21st in this category (last in the overall ranking). For the 20s age group, it is worth noting that Vermont is number 9 (3rd in the overall ranking). In the 30s age group, there aren't any big discrepancies. In the forties age group, Idaho is first (11th in the overall ranking) and Colorado is third (5th overall). The Top 3 in the 50s group bears no resemblance to the overall ranking. First is New Hampshire (10th overall), second - Connecticut (6th overall) and third is Maine (4th overall). In the over 60 age group, the fastest participants are from South Dakota (6th overall). Also worth noting is that Louisiana in this age group is not at the bottom but in 33rd place. 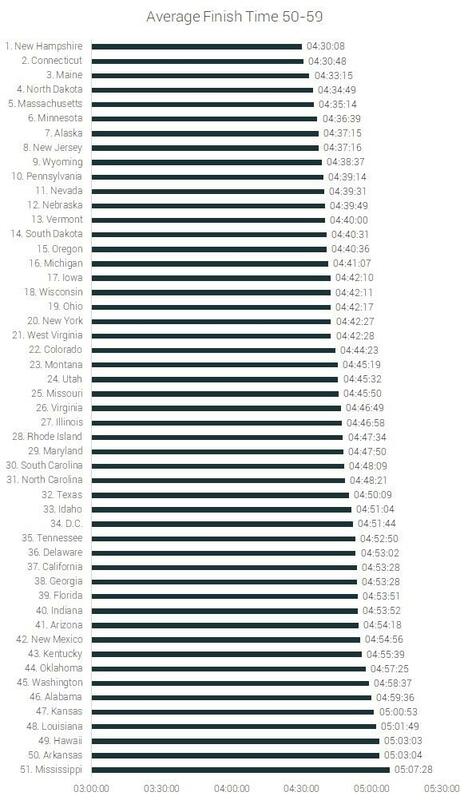 We compared the finish times of the young participants and the elderly participants and it turns out there are a few states whose elderly are faster than the youngsters from other states. The fastest participants over 50 are from New Hampshire. And they are faster than the participants under 30 from 10 other states - Oklahoma, North Dakota, Nevada, Louisiana, Texas, Arkansas, Delaware, Hawaii, Alaska, and Mississippi. We can see that in the following table. For example, the participants under 30 from Oklahoma (4:41:01) are slower than the Over 50 age group from New Hampshire (4:40:20). 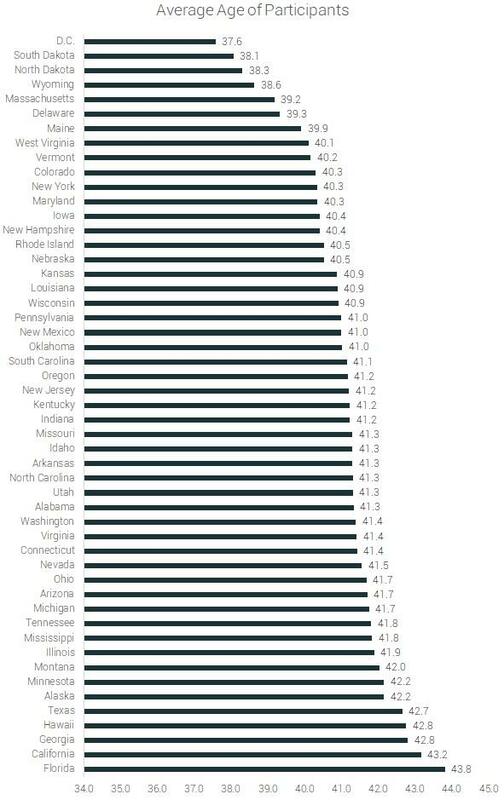 It doesn't look good for Mississippi's young participants who are slower than the elderly from 30 other states. We calculated the change in finish time across the age groups in every state. The purpose is to see how the marathoners speed change with age. The average slow down from one age group to the next is around 2.5%. Having a small slow down percentage though doesn't correlate with being fast. Most of the more consistent states just have slow young participants. 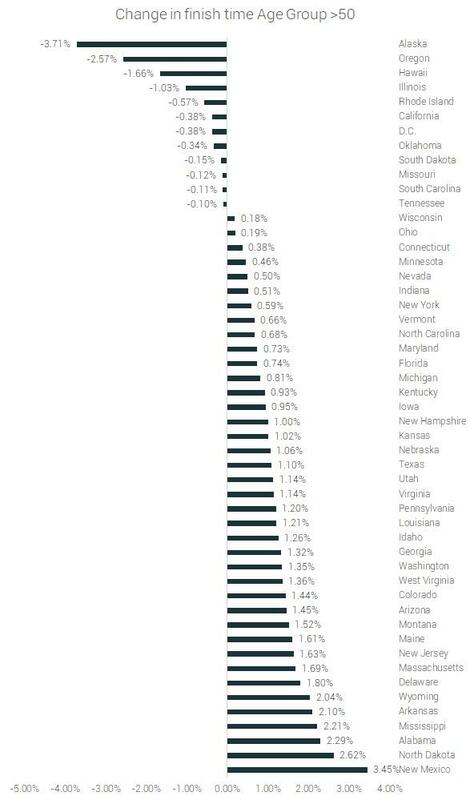 Turns out that the states with less change in performance in time are consistently slow and not consistently fast. All Top 3 states have an above-average decline in speed with age. 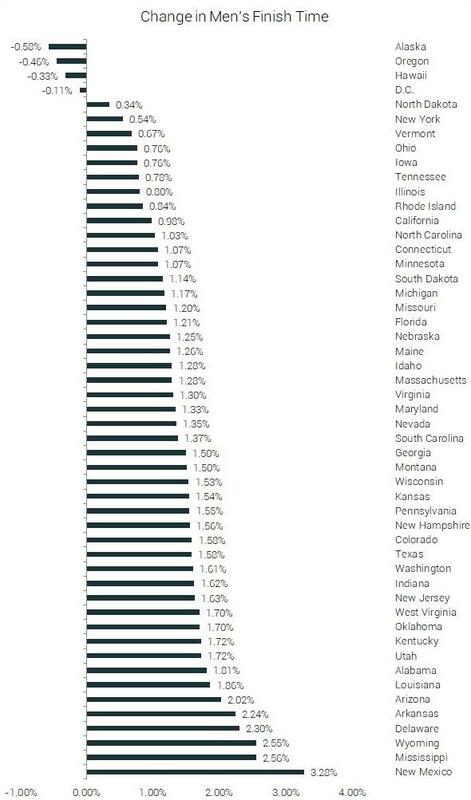 And two of the slowest states have a way below-average percentages - Hawaii (1.4%) and Mississippi (1.9%). The next factor we considered is the distribution of the participants among the age groups. 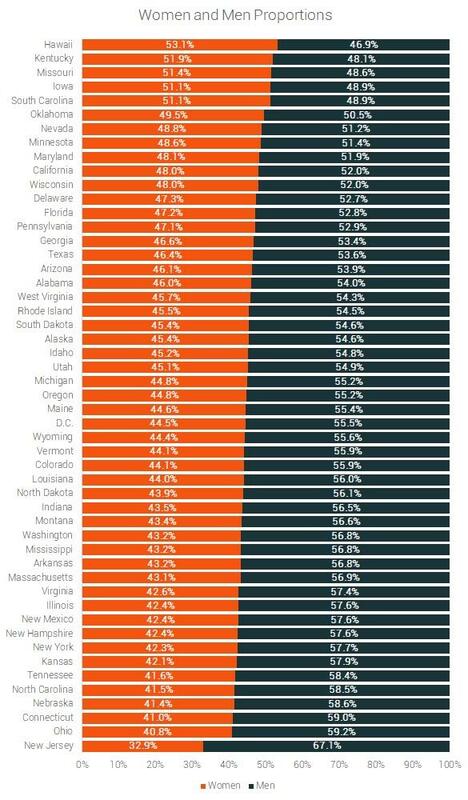 Turns out Alabama has not only the highest proportion of female participants but also the highest percentage of young people. In this category, we also calculated the ratios of young to elderly participants. The state with the highest ratio is D.C. with 2.4 people under 30 for every person over 50. The state with the most elderly people compared to young is Mississippi - for every young person, there are 1.8 people over 50. Though we have seen a lot of ways in which age is not the determining factor of speed, the fact that the Top 3 states have ratios over 1.5 and the Bottom 3 states have ratios below 0.9 is not lost on us. We calculated the total number of participants for every state for the whole period and Californians are the most active marathoners, with almost 20% more runners as the second ranking Illinois. 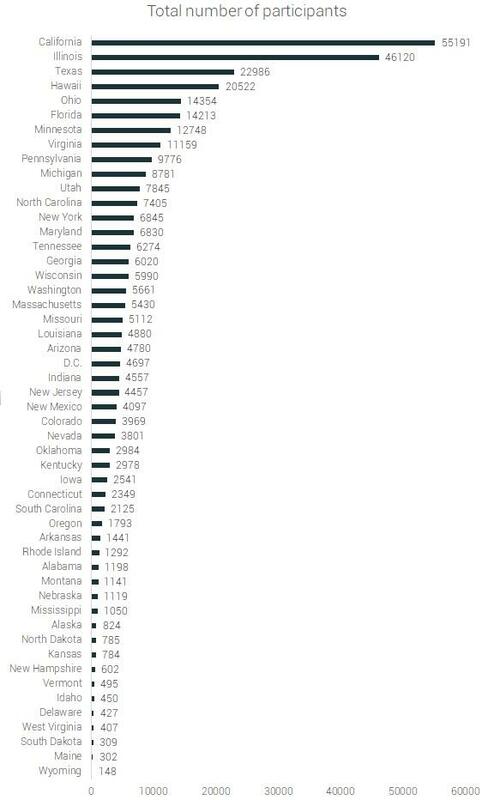 And also California has 370 times more marathoners than the bottom of the chart Wyoming. As you can guess, the total number of participants don’t tell the whole story. Let’s look at the number of participants as a percentage of the state’s population. This makes the picture completely different. Here Hawaii ranks number one! The last comparison criteria we’ll present is the change in the average finish times for the whole period 2000-2016. Surprisingly there are some states, which have actually gotten faster. We took the period 2000-2016 and calculated how the average speed for the state has changed in this time frame. As we see there are four states, which have actually gotten faster: Alaska, Oregon, Hawaii, and D.C.
We dug a bit deeper and calculated how the average finish time has changed gender-wise. 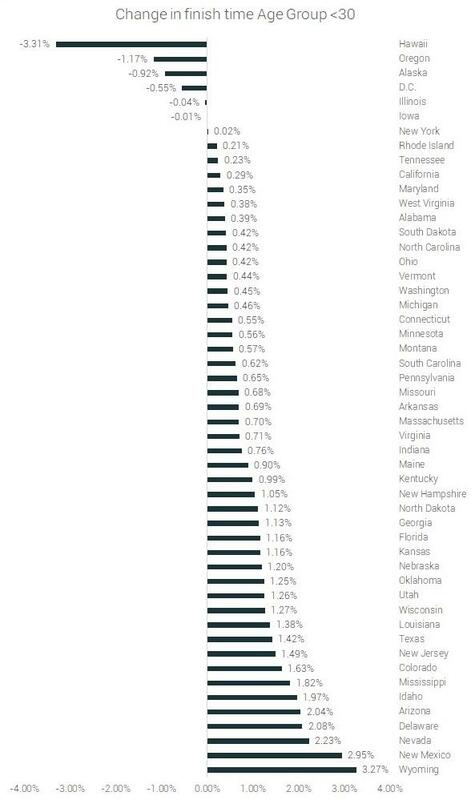 From this graph, we can see that the women from 9 states have gotten faster. Although Hawaii women are among the slowest in the US, they have the biggest improvement in the last 17 years. For the men, an improvement is visible just in the four states that have overall improvement. Also, the degree of improvement is about 4 times less than the one for the women. It is worth comparing the changes in male and female finish times for each state side by side. As we can see men are slowing down much more than women. On average women have lost 0.4% speed and men 1.3%. 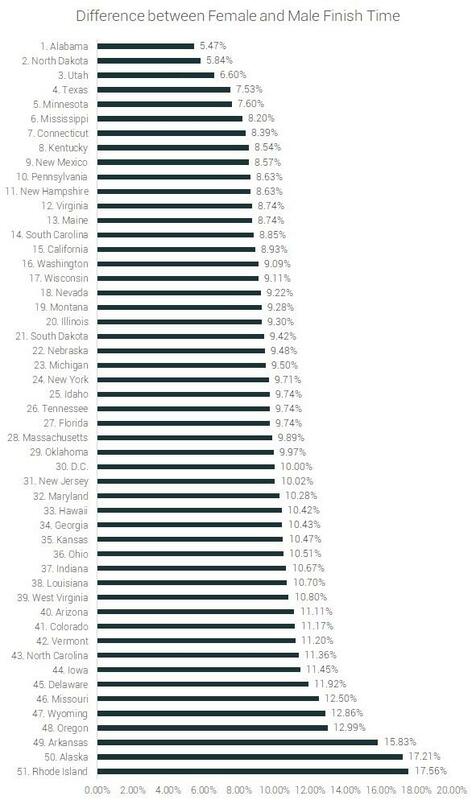 From the table above we can see that there are just two states - Wyoming and North Dakota, where women are doing worse than men in terms of change in speed. We performed the same analysis accounting for age. There are six states in which the participants under 30 are getting faster - Hawaii, Oregon, Alaska, D.C., Illinois, and Iowa. In the second age group from 30 to 49, we have four improving states. Here we have - Oregon, Alaska, D.C. and North Dakota (which was not present in the previous age category). And quite surprisingly there are 12 states in which the participants over 50 are getting faster. And the rates in which they are improving beat the ones of the younger participants. This finding is in agreement with the popular belief that millennials are retracting from endurance sports and the ones that are participating are doing it less competitively. As before, let’s take a look and compare the changes in speed by age group side by side. We can easily see that there are 9 states in which the young participants are the age group which is slowing down most. The fastest state in the US for 2016 is Massachusetts - in overall. The fastest women are from Massachusetts, the fastest men from Vermont. But this doesn't tell the whole story. The lead in this study is Jens Jakob Andersen. He was assisted by Vania Andreeva Nikolova. 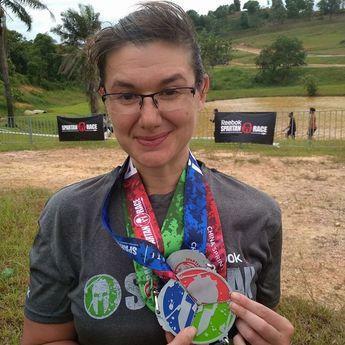 The team has the following credentials: Andersen is a former competitive runner and statistician from Copenhagen Business School, Nikolova holds a Ph.D. in Mathematical Analysis. At RunRepeat.com we collate reviews of running shoes. We do our utmost to assist runners in finding the right pair of running shoes at the best price. Also, we do in-depth studies on running. Learn more about what we do on our about page. We are happy to give interviews on the topic at any time. Reach out to Jens at jens@runrepeat.com. For web usage, any minor text sections, all data, and all graphics may be used as long as a reference is added to this original piece. For print usage, reach out to jens@runrepeat.com.